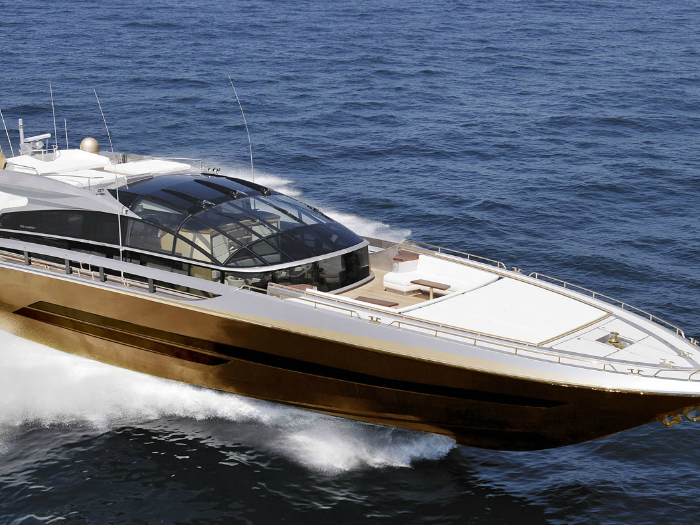 The yacht is made of 100 000 kilograms of gold, decorated with the bones of dinosaurs and tiny meteorites. The most expensive yacht in the world belongs to an anonymous Malaysian businessman. The thirty-meter yacht of the History Supreme series was built for three years, and it is claimed that about 100,000 kilograms of precious precious metals, gold and platinum, were taken to the ship. The precious metals were used in finishing the base of the ship, for the deck, the dining room, the railing and the anchor. The wall of one of the bedrooms is decorated with meteorites and real bones of the largest carnivorous dinosaur of the late Cretaceous period, Tyrannosaurus rex. The price of the Baia 100 Supreme yacht of the Malaysian businessman is 4.85 billion dollars. For comparison: the cost of the Eclipse yacht Russian businessman Roman Abramovich is, according to various estimates, in 500-800 million dollars and is now leased by the owner for $ 2 million a week. The length of the largest motor yacht and the most expensive yacht charter in the world is 162.5 meters. The name of the owner of the most expensive yacht was not disclosed. According to Forbes magazine’s ranking, the most wealthy Malaysian for 2011 can be Robert Kuok with a capital of 12.5 billion dollars, earned on sugar, palm oil, freight and real estate. The yacht may belong to another Malaysian businessman Ananda Krishnan, owner of the largest cellular operator of this country Maxis Communications, whose capital is 9.5 billion dollars. Assets of other Malaysian billionaires are estimated at $ 5 billion and less — if you spend it on a yacht, there will be literally a trifle for pocket expenses.